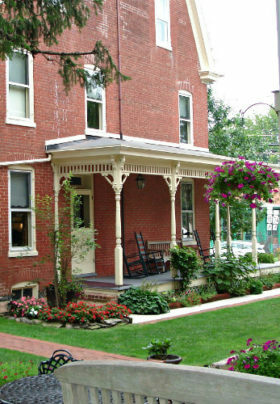 Enjoy a truly unique Pennsylvania bed and breakfast experience when you stay at the Brickhouse Inn. Our Gettysburg B&B is located within easy walking distance of many of the town’s attractions. Whether you are interested in the rich history of the area, visiting the Battlefield, seeing a Gettysburg reenactment, or enjoying the beautiful countryside, you will find it near the Brickhouse Inn. Please note that guests staying at our vacation rental properties are not entitled to breakfast at the Brickhouse Inn, nor to receive packages. However, we can arrange a licensed Battlefield guide. A reservation is not completed until a deposit has been made and a confirmation email or letter has been sent by the inn. Online reservations with invalid credit cards are not confirmed reservations. Online reservations can be made through our website (“Availability & Reservations”) but must be confirmed by us. Online published rates are for the current calendar year only. A two-night minimum stay is required for weekends from April through November and other ‘special’ weekends. A three-night minimum is required for Graduation Weekend in May, and a four-night minimum is required for the Re-enactment Weekend in July. Please check availability on our website (“Availability & Reservations”). We require a 50% deposit for a one-night stay or a 25% deposit for multiple nights. The deposit is taken at the time of the reservation, and is refundable, subject to the cancellation policies (below). WE STRONGLY RECOMMEND THAT YOU TAKE OUT TRAVEL INSURANCE TO REDUCE ANY FINANCIAL LOSS YOU MIGHT INCUR IF YOU HAVE TO CANCEL DUE TO UNFORSEEN CIRCUMSTANCES, SUCH AS ILLNESS, A FAMILY EMERGENY, CAR PROBLEMS OR WEATHER. A $25 per room processing charge will be applied to all cancellations. With 14 days or less notice (30 days for the Culp House and the Cricket House), non-arrival, or early departure, the guest will be liable for the entire booking, unless the room can be re-sold to another guest. Check-in time is from 3 p.m. to 7 p.m. Later check-ins by arrangement. Guests arriving before 3 p.m. are welcome to park at the Brickhouse Inn, subject to available space. Guests who cannot check in before 7 p.m. are responsible for making a prior arrangement with the Innkeepers. Check-out is by 11 a.m. Guests checking out late will be liable to pay an additional charge. Smoking, vaping and lighted candles are not permitted inside the buildings or on the porches and balconies. Smoking is permitted only on the rear brick patio behind the Victorian house and in the garden. Guests who do not respect these regulations will be charged for an additional night’s stay. Well-behaved children of 10 years and older, and accompanied by an adult at all times, are welcome, in rooms that can accommodate them. We regret that we cannot allow pets on the premises. The Brickhouse Inn takes security seriously. Every precaution is taken when a reservation is made, both online and offline, to safeguard our guests. Our Secure Sockets Layer (SSL) software encrypts all your personal information, including credit card number, name and address, so that it cannot be read over the internet. The Brickhouse Inn’s main purpose in collecting your personal information is to provide you a streamlined experience in making your reservation. Only information that is necessary is collected. Personal information is only obtained when making a reservation. No information collected will be disclosed to anyone else. The Brickhouse In does not give away or sell any information.